Randy Spencer is our employee of the month! I thought I’d catch up with our busy system administrator and learn how he works. 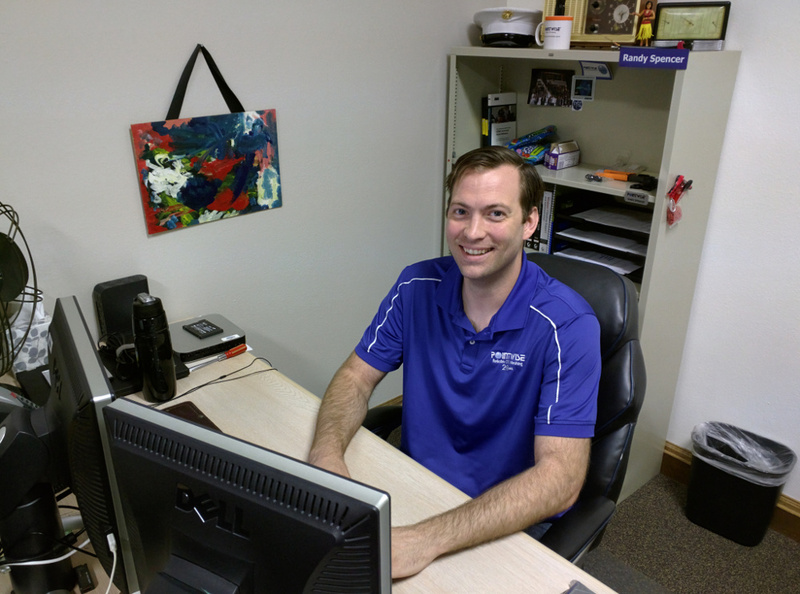 Randy Spencer, our System Administrator. The best way to describe how I mesh is, not at all. I have a general idea of what a mesh is and what it is used for, but that is about it. I worked in the Marine Corps in the signals intelligence field for five years after high school. I was able to visit Kuwait, Iraq, Okinawa, Guam, and South Korea before my time was up and I came back home to attend college. I earned my A.A. degree as well as an A.A.S. in Information Security before starting at Pointwise in 2010. While working here I have earned the A+, Linux+, and Security+ certifications from CompTIA. I have a small set of tools that I use to take care of our systems. Cygwin is a terminal window that runs on Windows machines. I use it to access all of our Linux, Mac, and network devices so that I can update them, install software, and make configuration changes. I use Remote desktop Connection to do the same tasks on our Windows machines and a program that was written by a previous developer to create and keep track all of our license files. My workspace covers the whole office. I spend a lot of time working from my desk, but sometimes I have to walk down to the server room, a co-workers desk, or a piece of network gear in a closet. My desk is usually covered by parts waiting to be installed and sticky notes to remind me what needs to be done. This changes day to day, which is one of the things I like about my job. One task I am working on is rebuilding a bunch of our machines for the developers working on Pointwise V18. I am also building two new servers to act as virtual hosts so that we can continue to virtualize as many machines as possible. Then there is the day to day fixing tickets, planning for future growth, and sending out license files. I think keeping track of everything going on it one of the things I do best. Every machine has its own quirks and I have to keep those in mind when I am working. I may find a solution for a problem that would break something else, so I have to anticipate that. Our servers can be especially difficult because we have Windows, Mac, and multiple versions of Linux running and trying to reach them. The only advice I can give relates to the license server side. The biggest problem I have seen with licensing is getting the correct Host ID for the server. The Host ID is also known as the MAC address or hardware address and every network adapter has one. This means that if you have an Ethernet connection and a Wi-Fi connection you will have two Host IDs for your server. Some servers may have more than two. The correct Host ID will be the one your server uses to connect to the network with and that’s the ID we use to generate your license file. One of the most difficult things I have done at Pointwise is migrate our network domain from LDAP to Active Directory. We decided to do the move because so many of our machines use Windows that it didn’t make much sense to continue using Linux-based authentication. It took a lot of planning, but we were able to pull it off and only had to purchase one new machine. The best analogy I have to explain it is that we had to build a new house around an older house while we were still living in it. Most of the reading I do is from Hot Rod and Car Craft, I subscribe to both. The best things I read are to my daughter. I think books from Dr. Seuss and Shel Silverstein have lessons that some adults still need to learn. I recently read her ‘Listen to the MUSTN’TS’, and I will continue to read it until it sticks. I will be attending Spiceworld 2015 in September. No, it is not a convention for fans of the 1997 Spice Girls movie. SpiceWorld is a convention for IT pros put together by Spiceworks, a free tool used for keeping an eye on our network. It is a great place to talk to other IT professionals about any problems they’ve encountered and solved in their environment and meet with vendors giving away free t-shirts. When I am not here I can be found in the garage. I love working on cars, new and old, but mostly old. I have a 1964 Cadillac and a 1948 Chevy, which get most of my attention. I have a nagging desire to figure out how things work, which leads to taking things apart and has successfully led me to repair everything from pocket watches and vintage fans to riding mowers and weed eaters. Because of the Marine in me, I also enjoy running and doing obstacle course races. I’ve run the Fort Worth Marathon twice and improved my time by 30 minutes. There is so much advice flying around that it is hard to focus on the really good pieces. Some of the best advice I’ve received is related to the benefits of self-reliance and to not fear failure. I have learned more than I could have imagined with just a little time on the internet and a willingness to fail completely. Not being afraid to fail is a big part of becoming more self-reliant, which is one of the best things anyone can do. Spending time educating your mind or strengthening your body will pay off in ways you never could have imagined. I really like food, so it is hard to pick a single place. King Tut is right around the corner from our office and has great chicken shawarma. Sana is a great Indian food place near my house that I don’t get to visit often enough. My favorite thing to make is a prime cut ribeye cooked to medium rare…my mouth waters just thinking about it. 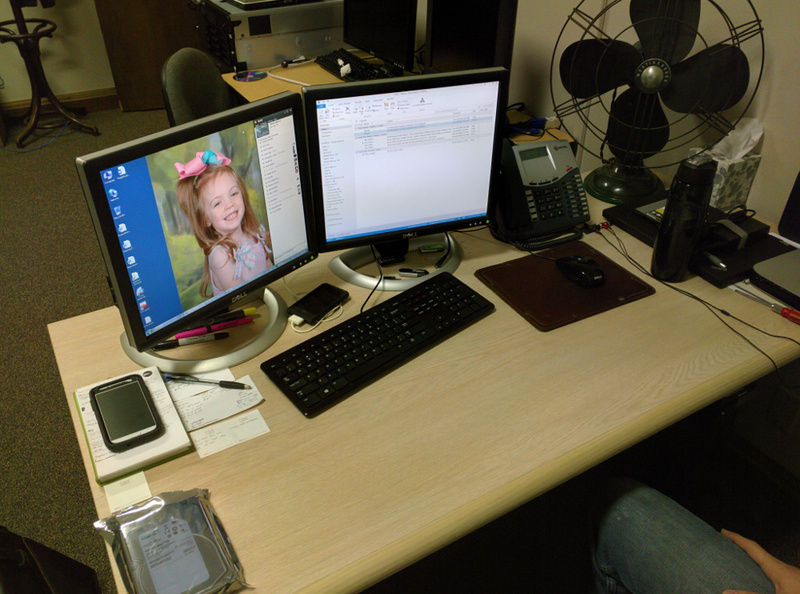 This entry was posted in People & Places and tagged Cygwin, IT, linux, This Is How I Mesh, workstations. Bookmark the permalink.